← TechniCity 2014 about to get underway…. At the end of 2013, I posted an initial citation analysis for urban planning academics using Google Scholar citations (see: http://tinyurl.com/pez64ex). I also emailed the individual data to each of the faculty included in the analysis to get their feedback. I would like to thank everyone who responded confirming or correcting their information, as well as those providing comments and suggestions. The results below summarize a more complete analysis that is being prepared for publication. There are a few things I would like to mention, each being discussed in much more detail in a forthcoming article. The previous analysis was based on the 2011 ACSP Guide to Undergraduate and Graduate Education in Urban and Regional Planning. This analysis uses the 2013 Guide (19th Edition). All schools and regular faculty (i.e., tenure track) in the Guide are included. Citation analysis is one of several ways to gauge faculty productivity and impact. Teaching, service, funded research, etc. are other facets of what we do, but are not accounted for. Therefore scholarly publication is the focus here. Google Scholar citation counts (as of March – May 2014) were used for the analysis. There is some debate about the accuracy of Google Scholar versus Scopus or Web of Science, about which I will provide a complete discussion in an upcoming publication. Traditional citation analysis includes books, chapters, and journal articles – materials commonly controlled by publishers. The nature of “citations” is changing and Google Scholar reflects this by including some non-traditional citation types. I argue Google Scholar is quite appropriate for the field of planning. (See an earlier discussion in my paper from the Journal of the World Universities Forum). School/program rankings are based on median values (instead of mean) to control for outliers. 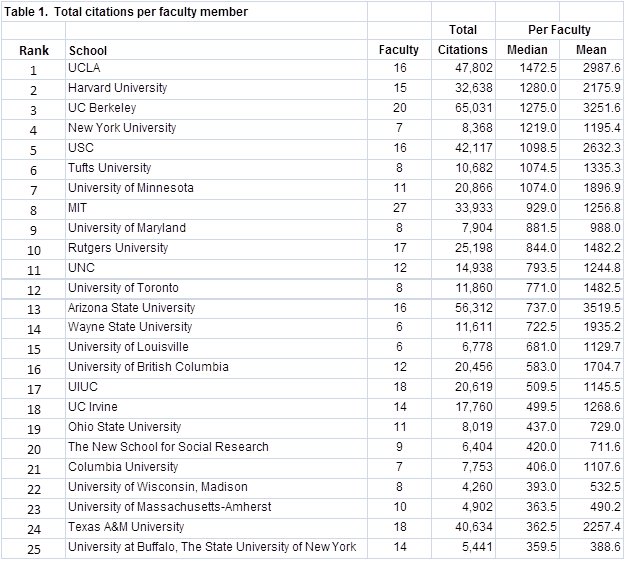 For instance, Arizona State University has the highest mean number of faculty citations (one of their faculty members has the highest number of citations among planning programs), but is ranked 12th using the median number of citations. Citation data are dynamic and change daily. What is presented below is a snapshot at a particular point in time. The uniqueness of author names influences the accuracy of citation counts. Common names, name changes, non-use of middle initials or middle names (by authors or publishers), misspellings, and other parsing errors can lead to improperly attributed publications. 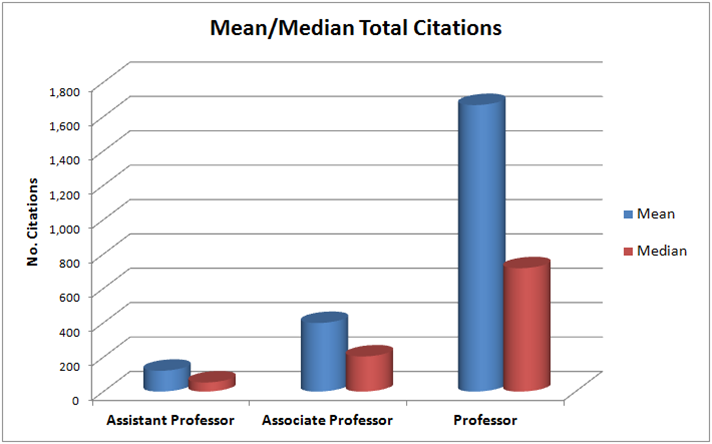 The number of citations per year is used to control for the age of faculty members. Programs with older faculty are expected to have greater numbers of citations – just by virtue of having more time. Unfortunately, the exact year that a faculty member started their academic career is not known, so the year they obtained their terminal degree is used as a proxy. There is also no data available on leaves taken or time off. I use data directly from Google Scholar Citations where faculty have existing profiles. These are assumed to be correct and contain only publications authored or co-authored by them. There were 202 profiles out of the 923 faculty included in the analysis. I welcome your questions, comments, and suggestions. 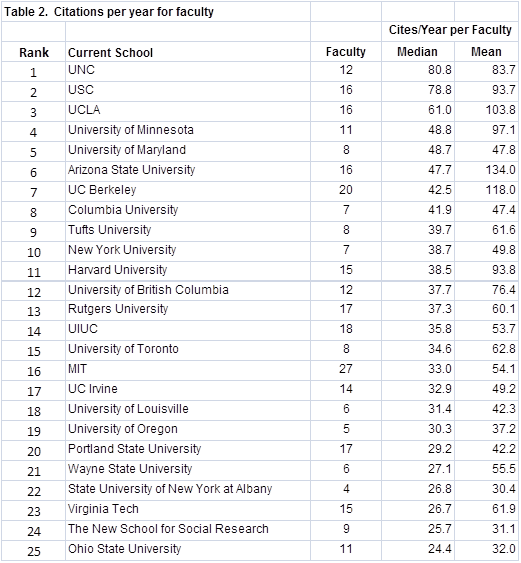 Table 1 list the top 25 planning schools based on the median number of GS citations per faculty member. Table 2 lists the top 25 in terms of citations per year of service (or year since degree) to account for faculty age or experience. The citation data can also be compared by the school where each faculty member received their terminal degree (usually a PhD). 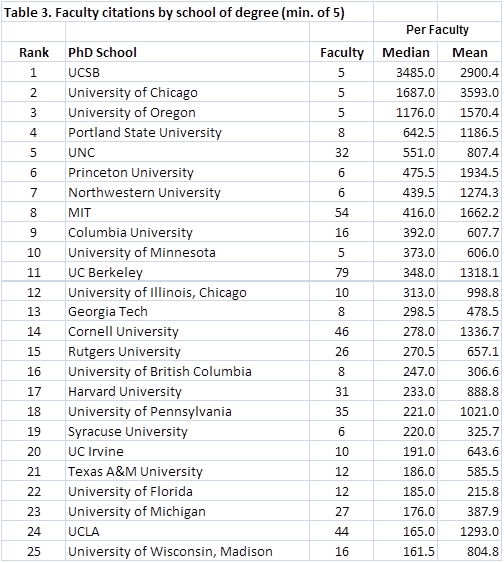 Table 3 shows the top 25 universities (not necessarily planning degrees) in terms of median total citation output. Although there is a significant amount of variation among individual planning faculty citations that effect department-level performance, there are distinct trends based on seniority. 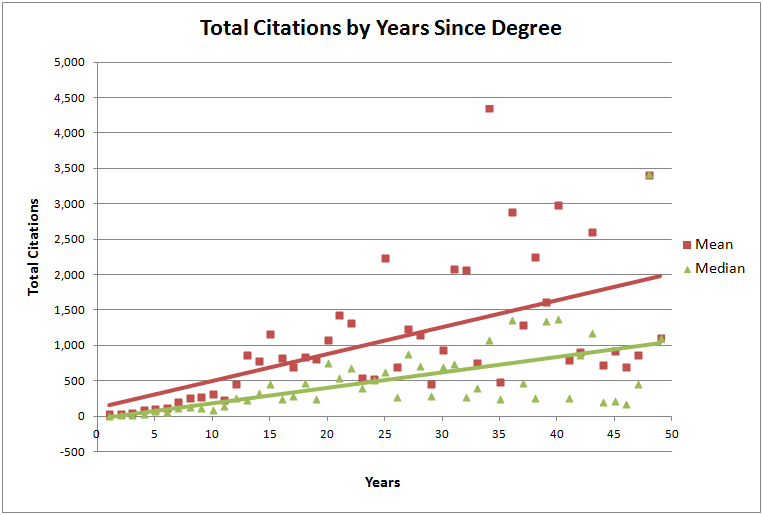 Figures 1 and 2 show both increasing mean and median citation totals by years of experience and rank. Finally, there are many planning faculty with citation totals far exceeding the average levels discussed (the top 25 are shown in Table 4). All of the previous summary information for planning schools is based on GS citation totals for individual planning faculty. These totals will change over time as the data are corrected and updated as previously mentioned. Please direct your questions or comments to me at: tom.sanchez@vt.edu. *This table was updated on 10/9/2014 due to an error detected in Google Scholar citation counts.